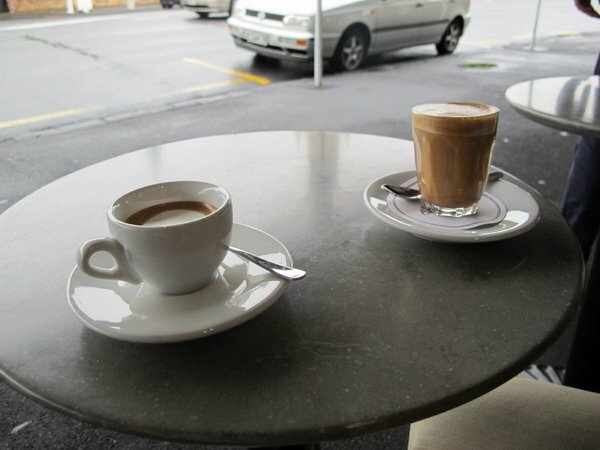 So add this to the list of things for Aussies and Kiwis to fight over – the flat white. Along with lamingtons and pavlova we both lay claim this antipodean beverage, something I always took for granted as the most boring of the espresso-based drinks. I never realised the flat white had such controversial origins, nor the fact that it would one day become the coffee of choice for hipsters from New York to London. But the flat white is not the reason I decided to visit Allpress’s flagship store in trendy Ponsonby, Auckland; frankly, I couldn’t care less about flat whites, miniscule coffees are more my scene. I’d been a fan of Allpress ever since I came accross it’s Sydney Roasterie in Zetland. When I first bloogged about them, I cited them as the Kiwi export I’d most like to call my own. So I was excited to check out their teensy Ponsonby store and see what’s what. We arrived on a rainy I’m-not-sure-what-day-it-was, as we spent the majority of our trip to NZ drinking and thus time ceased to have much meaning. Ponsonby road is a strip of cafés and restaurants with an up-to-the-minute but kind of upmarket feel – a little bit Balmain with a touch of Paddington. But smaller. And quieter. Allpress is a narrow shop with a few stools inside and outside and a couple of tables. From what I can tell, they only serve coffee and biscuits. I’m glad I was travelling with our Texan host, who doesn’t drink the coffees Senhor R and I do (a macch and a piccollo, full cream, no sugar if you ever want to shout us). It gave me an entirely different take on the place than I would’ve had if I’d just gone with Senhor R. Ms Texan stepped up to the counter and ordered her standard fare – a large trim (skim) flat white with two equals, in a takeaway cup. Only to be told they don’t have large cups. Or equal. Or trim (skim) milk. Now, I know there are places with only one size of cups, and places that don’t stock equal. Or maybe they don’t have syrups, or soy milk. But it seems really fricking WEIRD to me to run a cafe that prepares nothing but coffee and not to offer your customers skim milk. I also think it’s weird that the people working there didn’t think this was weird, if you know what I mean. This wasn’t announced anywhere, a la Bar Italia et. al. This wasn’t a voluntary simplicity/freedom from choice philosophy they just…don’t…have…skim. Or soy. Or equal. Or large cups. My coffee was good, Senhor R’s was too milky. Ms Texan’s? Well, it was too creamy, small and sugary, if you really want to know. I’d go back for sure, but I doubt she will, which is a shame as she live in Auckland. Woops. Sorry for laughing out loud at the no takeaway cup, no skim and no equal. Hilarious. No sugary vanilla syrup? That explains the abundance of cafee’s I came across in the States that serve their inhouse coffee in takeaway containers. How very Starbucks. I’ve been to Auckland just once and remember walking the main drag of Ponsonby and thinking how organised, clean and quaint it was. As for the Kiwis taking claim of the ‘flet’ white …. I am earmarking this for a visit when next in Auckland. Forgetting the flat white, hoping they do a decent macchiatto instead. I had no idea about the Kiwis claiming th FW…they can keep it really as far as I am concerned. Give me a good stong mac any day. Having said that, I love all those beans lined up in a row…pity about the lack of skim milk too. Never been to NZ, but hoping to get there this year. Love flat whites, so I think Aussies should claim them!